“The first examples of reversal of cognitive decline in Alzheimer’s disease and the pre-Alzheimer’s disease conditions MCI (Mild Cognitive Impairment) and SCI (Subjective Cognitive Impairment) have recently been published..showing sustained subjective and objective improvement in cognition, using a comprehensive, precision medicine approach that involves determining the potential contributors to the cognitive decline (e.g., activation of the innate immune system by pathogens or intestinal permeability, reduction in trophic or hormonal support, specific toxin exposure, or other contributors), using a computer-based algorithm to determine subtype and then addressing each contributor using a personalized, targeted, multi-factorial approach dubbed ReCODE for reversal of cognitive decline. “We have a paper in press, due to appear 10.22.18 (open access, JADP, I’ll send a copy as soon as available), showing 100 patients with documented improvement – some with MRI volumetrics improved, others with quantitative EEG improvements, others with evoked response improvements, and all with quantitative cognitive assessment improvement. Some are very striking – 12 point improvements in MoCA, for example – others less so, but all also have subjective improvement. Hopefully this will address some of the criticisms that we haven’t documented improvement in enough people. We were just turned down again for a randomized, controlled clinical trial, so on the one hand, we are told repeatedly that no one will believe that this approach works until we publish a randomized, controlled study, and on the other hand, we’ve been turned down (first in 2011/12, and now in 2018), with the complaint that we are trying to address more than one variable in the trial (as if AD is a single-variable disease!). Something of a catch-22. We are now resubmitting (unfortunately, the IRBs are not populated by functional medicine physicians, so they are used to seeing old-fashioned drug studies), and we’ll see what happens. I agree with you that there are many features in common with aging itself. You made a good point that APP is a dependence receptor, and in fact it functions as an integrating dependence receptor, responding to numerous inputs (Kurakin and Bredesen, 2015). In the book and the publications, we don’t claim it is a “cure” since we don’t have pathological evidence that the disease process is gone. What we claim is “reversal of cognitive decline” since that is what we document. As I mentioned in the book, AD is turning out to be a protective response to multiple insults, and this fits well with the finding that Abeta has an antimicrobial effect (Moir and Tanzi’s work). It is a network-downsizing, protective response, which is quite effective – some people live with the ongoing degenerative process for decades. We have seen several cases now in which a clinical trial of an anti-amyloid antibody made the person much worse in a time-dependent manner (each time there was an injection, the person would get much worse for 5-10 days, then begin to improve back toward where he/she was, but over time, marked decline occurred), and this makes sense for the idea that the amyloid is actually protecting against pathogens or toxins or some other insult. It is important to note that we’ve never claimed that all people get better – this is not what we’ve seen. People very late in the process, or who don’t follow the protocol, or who don’t address the various insults, do not improve. It is also turning out to be practitioner dependent – some are getting the vast majority of people to improve, others very few, so this is more like surgery than old-fashioned prescriptive medicine – you have to do a somewhat complicated therapeutic algorithm and get it right for best results. I’m very interested in what is needed to take the next step in people who have shown improvement but who started late in the course. For example, we have people now who have increased MoCA from 0 to 9 (or 0 to 3, etc. ), with marked subjective improvement but plateauing at less than normal. These people had extensive synaptic and cellular loss prior to the program. So what do we need to raise the plateau? Stem cells? Intranasal trophic support? Something else? nor does there seem to be one simple treatment that works for most. It is a network-downsizing, protective response, which is quite effective. For a framework of an AD cure to be valid, each source of each insult that evoked each “protective response” should be traced. Longitudinal studies would be preferred inside this framework. These study designs would investigate evidence of each insult’s potential modifying effect on each “protective response” that could affect the cumulative disease trajectory of each individual. Treating prenatal stress-related disorders with an oxytocin receptor agonist. Transgenerational epigenetic effects of maternal obesity during pregnancy. “Ancestral exposure to the toxicant vinclozolin induces an epigenetic transgenerational increase in susceptibility to prostate pathology in F3 [male great-grandchildren] generation rats. These results are in agreement with previous studies which found a transgenerational increase in rates of prostatic epithelial atrophy, cystic hyperplasia, and prostatitis in the transgenerational F3 and F4 [male great-great-grandchildren] generations after exposure of F0 [great-great-grandmother] generation pregnant rats to vinclozolin. These effects were accompanied by transgenerational changes in mRNA expression in F3 generation ventral prostate epithelial cells. A number of previous transgenerational studies have shown no ventral prostate histopathology or disease detected. Therefore, observations suggest ancestral exposure specificity in the ability to induce the transgenerational inheritance of prostate disease. There was also no increase in prostate histopathology in the directly exposed F1 [male children] or F2 [male grandchildren] generation vinclozolin lineage rats compared to controls. The mechanism by which epigenetic transgenerational inheritance affects prostate epithelium involves control of gene expression by DNA methylation and lncRNAs. It will be necessary to determine the exact gene targets of these epigenetic modifications to determine further mechanisms. There was no increase in ovarian disease in direct fetal exposed F1 or germline exposed F2 generation vinclozolin or DDT lineage rats compared to controls. A disturbance in the paradigm of child abuse referenced other studies that found generation-skipping effects. Serious researchers are closer to discovering evidence for precise mechanisms of epigenetic transgenerational inheritance. It’s well past time that other researchers performing studies like Burying human transgenerational epigenetic evidence take their work seriously enough to truly investigate human evidence for epigenetic transgenerational inheritance. What are more important funding priorities than such human studies? “For half a century, a high level of total cholesterol (TC) or low-density lipoprotein cholesterol (LDL-C) has been considered to be the major cause of atherosclerosis and cardiovascular disease (CVD), and statin treatment has been widely promoted for cardiovascular prevention. However, there is an increasing understanding that the mechanisms are more complicated and that statin treatment, in particular when used as primary prevention, is of doubtful benefit. The authors of three large reviews recently published by statin advocates have attempted to validate the current dogma. This article delineates the serious errors in these three reviews as well as other obvious falsifications of the cholesterol hypothesis. The association between the absolute risk reduction of total mortality in 26 statin trials [squares] included in the study by Silverman et al. 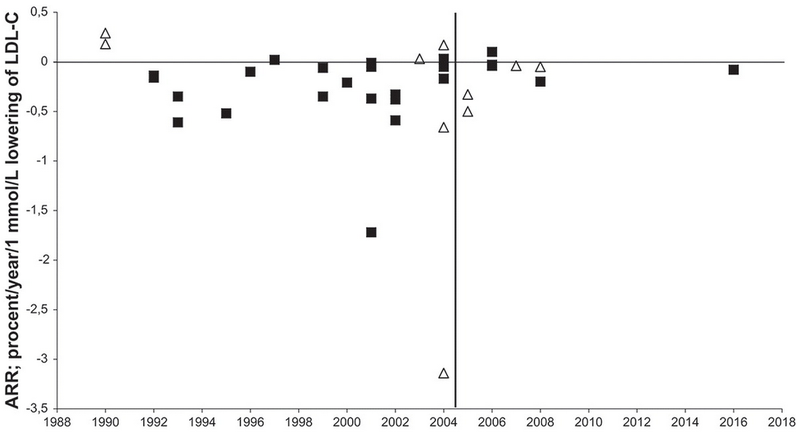 and in 11 ignored trials [triangles] and the year where the trial protocols were published. The vertical line indicates the year where the new trial regulations were introduced. This paradigm was proven wrong eighty years ago! How much longer will its harmful consequences continue? 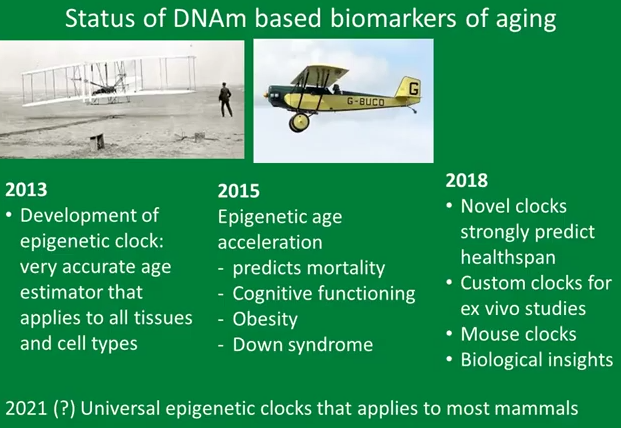 This 2018 presentation by the founder of the epigenetic clock method described the state of the art up through July 2018. The webinar was given on the release day of The epigenetic clock now includes skin study. Segments before the half-hour mark provide an introduction to the method and several details about the concurrently-released study. The Q&A section starts a little before the hour mark. “A synthetic, nonsteroidal estrogen, DES was administered to pregnant women under the mistaken belief it would reduce pregnancy complications and losses. From the late 1930s through the early 1970s, DES was given to nearly two million pregnant women in the US alone. Use of DES in pregnancy was discontinued after a seminal report showed a strong association with vaginal clear cell adenocarcinoma in prenatally exposed women. A recent analysis of the US National Cancer Institute (NCI) DES Combined Cohort Follow-up Study showed elevated relative risks of twelve adverse health outcomes. This study had many elements in common with its wretched cited reference  “Transgenerational effects of prenatal exposure to the 1944–45 Dutch famine” which is freely available at https://obgyn.onlinelibrary.wiley.com/doi/full/10.1111/1471-0528.12136. Its non-statistical data was almost all unverified self-reports by a self-selected sample of the F2 grandchildren, average age 37. No detailed physical measurements or samples were taken of the F2 grandchildren, or of their F1 parents, or of their F0 grandparents, all of which are required as baselines for any transgenerational epigenetic inheritance findings. No detailed physical measurements or samples were taken of their F3 children, which is the generation that may provide transgenerational evidence if the previous generations also have detailed physical baselines. What could be expected from a study design that didn’t include F3 subjects, which is the only generation that didn’t have direct DES exposure? A study design that permitted NON-evidence like educational level? Human studies of possible intergenerational and transgenerational epigenetic inheritance are urgently needed. There will be abundant evidence to discover if researchers will take their fields seriously. 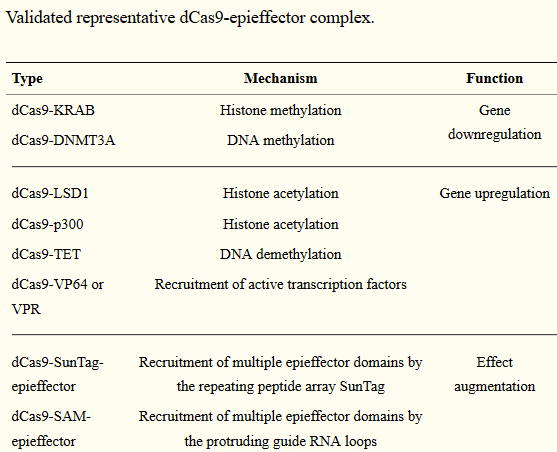 “CRISPR/Cas9-mediated epigenome editing holds a great promise for epigenetic studies and therapeutics. It could be used to selectively modify epigenetic marks at a given locus to explore mechanisms of how targeted epigenetic alterations would affect transcription regulation and cause subsequent phenotype changes. For example, inducing histone methylation or acetylation at the Fosb locus in the mice brain reward region, nucleus accumbens, could affect relevant transcription network and thus control behavioral responses evoked by drug and stress. Epigenome editing has the potential for epigenetic treatment, especially for the disorders with abnormal gene imprinting or epigenetic marks. Targeted epigenetic silencing or reactivation of the mutant allele could be a potential therapeutic approach for diseases such as Rett syndrome and Huntington’s disease. Noncoding RNA plays important roles in gene imprinting and chromatin remodeling. CRISPR/Cas9 has been shown to be potential for manipulating noncoding RNA expression, including microRNA, long noncoding RNA, and miRNA families and clusters. The reviewers cited three references for in vivo studies of this technique. Overall, I didn’t see that any of the review’s references were in vivo human studies. “We present a new DNA methylation-based biomarker (based on 391 CpGs) that was developed to accurately measure the age of human fibroblasts, keratinocytes, buccal cells, endothelial cells, skin and blood samples. We also observe strong age correlations in sorted neurons, glia, brain, liver, and bone samples. The skin & blood clock outperforms widely used existing biomarkers when it comes to accurately measuring the age of an individual based on DNA extracted from skin, dermis, epidermis, blood, saliva, buccal swabs, and endothelial cells. Thus, the biomarker can also be used for forensic and biomedical applications involving human specimens. 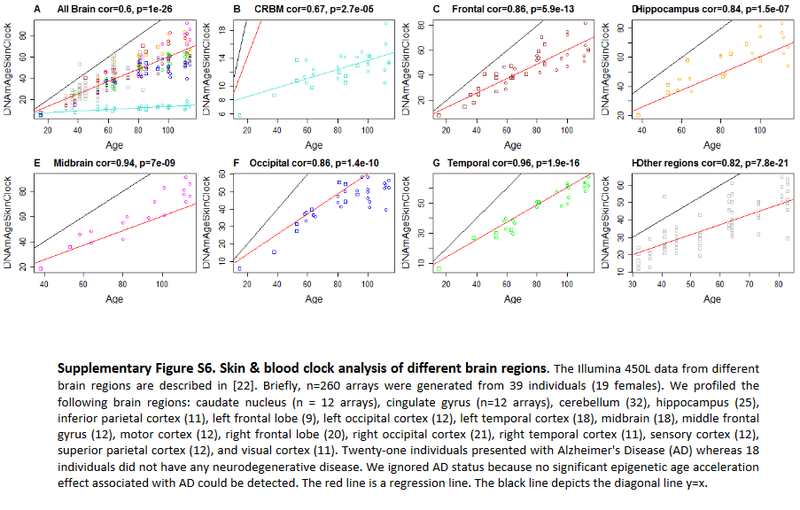 The biomarker applies to the entire age span starting from newborns, e.g. DNAm of cord blood samples correlates with gestational week. Furthermore, the skin & blood clock confirms the effect of lifestyle and demographic variables on epigenetic aging. Essentially it highlights a significant trend of accelerated epigenetic aging with sub-clinical indicators of poor health. Conversely, reduced aging rate is correlated with known health-improving features such as physical exercise, fish consumption, high carotenoid levels. As with the other age predictors, the skin & blood clock is also able to predict time to death. “Although the skin-blood clock was derived from significantly less samples (~900) than Horvath’s clock (~8000 samples), it was found to more accurately predict chronological age, not only across fibroblasts and skin, but also across blood, buccal and saliva tissue. A potential factor driving this improved accuracy in blood could be related to the approximate 18-fold increase in genomic coverage afforded by using Illumina 450k/850k beadarrays.